While Warner Bros. circulating surveys in order to gauge interest in which DC Comics properties they should adapt to animated films in the future is nothing new, they certainly are exciting to ponder over whenever they leak. And thanks to Film Buff Online, we have much to geek out over today, especially if you’re a fan of either Watchmen or Batman. 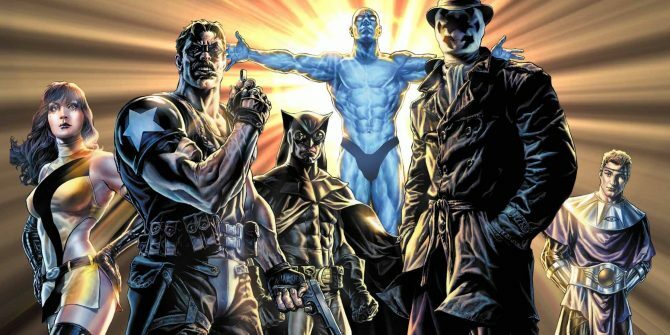 I guess we’ll talk about Watchmen first since nothing has been heard on that front outside of comics in quite some time. According to the report, such an adaptation could be the first in a series of animated movies, although we’re guessing such a thing would be contingent on the success of the first. 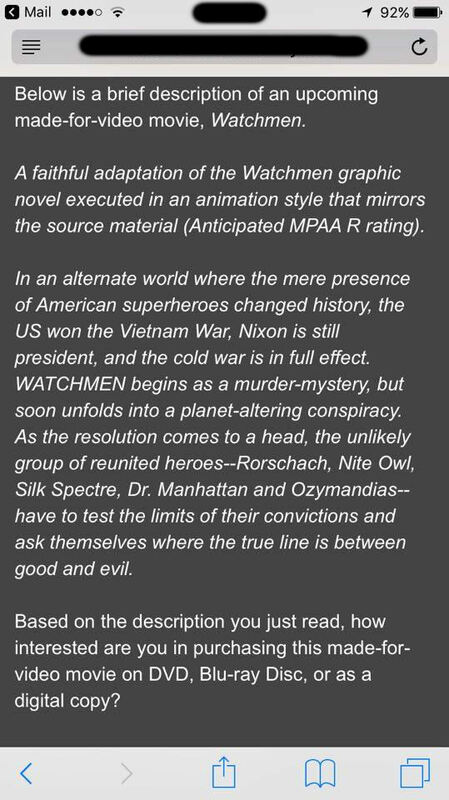 Immediately, my mind shifts toward the various Before Watchmen miniseries that DC released several years ago, each of which could be mined for a string of flicks, but as the screenshot of the synopsis taken from the survey (seen at the bottom) implies, this proposal sounds like yet another adaptation for Alan Moore and Dave Gibbons’ classic graphic novel. Given that Zack Snyder’s take was very accurate aside from not having the giant squid popping up at the end, going this route would seem almost redundant. Not surprisingly, WB won’t allow the Dark Knight to stay on the shelf longer than a few months and are seemingly giving serious thought to making fan favorites such as Batman: The Long Halloween and A Death in the Family a reality. Being frank, it might be best if they go with the former because Tim Sale’s art style would look damn good in animation and also because the latter was somewhat touched on in Under The Red Hood, unless, of course, a prequel is in mind. Beyond that, Gotham Academy was also mentioned. In addition to those, Swamp Thing (not the first time this was included in a survey), Superman: Red Son, Scooby Apocalypse, and some Vertigo titles dominated the list, namely Fables, Lucifer, iZombie, Hellblazer, Preacher and Sandman. Granted some of you will argue that a few of the latter ones mentioned aren’t in need of such a treatment, but do keep in mind that Lucifer and iZombie‘s TV series are markedly different from their comic book counterparts, so staunch purists would probably welcome them with open arms. Oddly enough, Afterlife with Archie rounded it out. Although it admittedly sticks out like a sore thumb because it has nothing to do with DC, need we remind you that WB recently inked a deal with Archie Comics to adapt more of their properties other than Riverdale, so this could very well pan out. Should Watchmen or any of these other titles gain any traction in the coming months, we’ll be sure to keep you posted. In the meantime, feel free to tells us which ones you’d most like to see in the usual place below!